The Kim Jong Un regime in North Korea has ramped up the use of overseas slave labor to prop up its economy in the face of stiff sanctions, leading to what former North Korean construction official and defector Roh Hui-Chang said is "no different from a prison camp." Prisons in North Korea are among the worst in human history, so many assume the lives of a overseas workers constitute an improvement, but they face impossible work requirements and seizure of almost all of their wages. 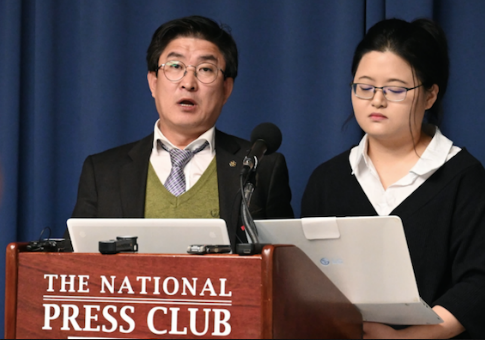 At the National Press Club Friday, Roh explained the inner workings of the system Friday, recalling his experience working overseas and overseeing foreign construction projects. The system to control workers is diabolically effective: No workers are able to hold onto their wages because the vast majority is confiscated for a "loyalty fund." They also receive demerits for failing to complete the impossible daily requirements, obliging them to do more work. No one can leave because their passports are seized, they have minders who keep watch over them, and they aren't ever by themselves. If one gets away, those who were with him are punished, creating a culture of mutual suspicion and control. "You are not allowed to take any kind of individual action," Roh said. The United States has imposed harsh sanctions on North Korea but sending workers overseas is one of the most effective ways the regime can get around those sanctions. Most of them work in China and Russia, which have both undermined sanctions efforts. Chinese front corporations allow some North Korean workers to be sent to other countries without the hosts even realizing it, and it’s difficult to know the extent of North Korean slave labor across the globe. Estimates of the total amount of workers overseas varies from 50,000 to 147,600, and it’s one of the regime’s best income sources: Studies estimate the laborers raise up to $1.2 to $2.3 billion annually, equivalent to 93 percent of North Korea’s total exports in 2016. This money largely goes toward Kim’s nuclear program. Restricting North Korean international economic clout has been a priority for the Trump administration as President Donald Trump has engaged Kim Jong Un in negotiations. Suzanne Scholte, chair of the North Korea Freedom Coalition, moderated the talk and said the U.S. foreign policy team is keeping the pressure on North Korea’s economy in the face of these challenges. "With the team of [National Security Adviser] John Bolton and [Secretary of State] Mike Pompeo, there hasn’t been any backing away on sanctions," Scholte said. From his time in Kuwait and other Middle Eastern countries, Roh said the workers would be forced to live with 10-30 others in a single room of about 10-20 square meters, which was made worse by the desert heat. This routinely led to illnesses among the workers, who received little to no treatment and were often sent back to North Korea to die. Chillingly, relatives back in North Korea began to think the Middle East was inherently unsafe because so many workers came back dying. When a friend fell ill in Russia, he told Roh he had "resolved to die." He previously sold everything he owned to go to Russia and make money for his family, but he was sick and unable to provide much for them and decided they'd be better off if he passed away, since he'd heard workers' families were compensated when they died overseas. He poisoned himself with aspirin and beer and died in St. Petersburg—his family got nothing from the government. It was during his time in Russia that Roh decided to defect. He got a call telling him his friend Jang Song-Thaek was executed and he should await further orders. He couldn't believe one of Kim's highest officials was killed so suddenly, so he confirmed the fact through Radio Free Asia. To avoid being arrested by North Korean officers for his connection to Jang, he ran. After about half a year he made it to South Korea and has worked in business ever since. He says he is a businessman first but feels compelled to speak around the world about human rights. The regime is able to extract this toll on workers because of the education system, South Korean lawyer and human-rights advocate Kim Tae-Hoon explained. Propaganda about America and Kim's divine authority begins at a young age, but what's often unknown is how much forced labor children do. Agricultural labor is disguised as a way of instilling work ethic, but children end up being forced into hard labor with little learning, leading to high schoolers spending months away from home working on farms from early in the morning until night time with "no regard for health and safety." What little they have is taken from them in perverse item-collection campaigns carried out through the school system. Children are required to procure supplies to "donate" to the regime, giving away the few valuables they may have. "Hope seems fragile," Kim Tae-Hoon said about the human rights situation, "but this should only galvanize us." Both Roh Hui-Chang and Kim Tae-Hoon expressed concern about the focus on denuclearization in Korea, to the exclusion of human rights for North Koreans. Kim took issue with South Korean President Moon Jae-In for ignoring the plight of North Korean citizens, saying he's troubled by how Moon's focus on making peace has filtered down into the whole country. "In South Korea, we are going through our darkest hour now," Kim said. "North Korean human rights are not mentioned anywhere in our media or public spaces." After Moon worked as a human rights lawyer, "how can he be so silent?" Kim asked. Roh said the primary threat to peace on the Korean peninsula is not weapons but the stranglehold Kim has on North Koreans' rights. "If North Koreans are given freedom of expression, denuclearization will happen naturally," Roh said. This entry was posted in National Security and tagged Kim Jong Un, North Korea, South Korea, Trump Administration. Bookmark the permalink.